Posted in CityPlanning	Bookmark the permalink. I agree that the London Eye was a great experience. 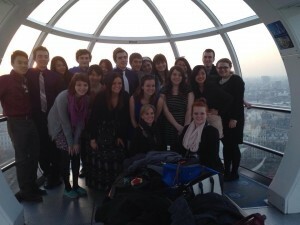 From our space on the Eye, we had multiple vantage points of the city of London as we moved in a circle along the path. Riding the Eye during sunset provided a beautiful background against the London skyline. Also, from this vantage point I was able to get a different view of the city than from other buildings such as St. Paul’s. The Eye was a nice way to end that day, showing how everything we visited during the day relates to each other. The Eye is definitely an iconic piece in London’s skyline.